A few weeks ago, I was working on the finishing of a beautiful necklace. 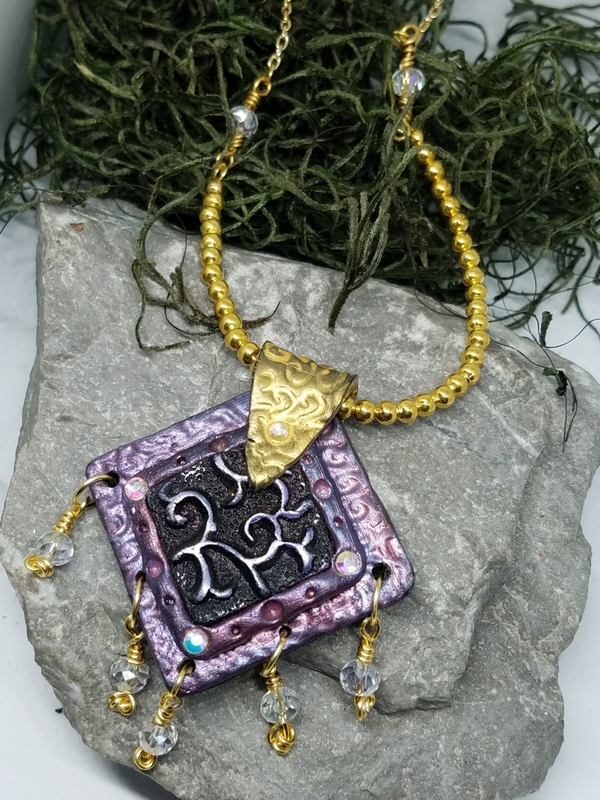 I had worked the polymer clay into a design that I loved and baked it...then I added more to the design and baked it again. I had wire wrapped beautiful crystals and dangled them to the piece. All in all, it was looking fabulous and I was in love! I was on the last part...wire wrapping a bail so I can add it to strand of beads...and I broke the corner off the piece right off, as I pulled too hard. Frustrating and anger at myself bubbled up fast, and the piece was tossed onto my worktable in what could probably be termed a tiny temper tantrum. I walked away from my worktable, as in just that quick moment, my creativity buzz had died. After a bit, I went back to the piece and refused to give up on it. It was too pretty to let it go. I filed down the rough edge from the break, added more clay and created a beautiful bail. I have to say...I love the piece more now than I would have with the original design. I am very proud of that necklace...with perseverence and creativity, it is never over. There are tough lessons. In creating (and in life in general), there are bumps in the road. We learn ways to work around those bumps. It is important to remind ourselves that we have the power to overcome those little pitfalls. With the right tools in our toolbox of life, anything is possible. Never give up! Look at my pretty piece that I now have! !